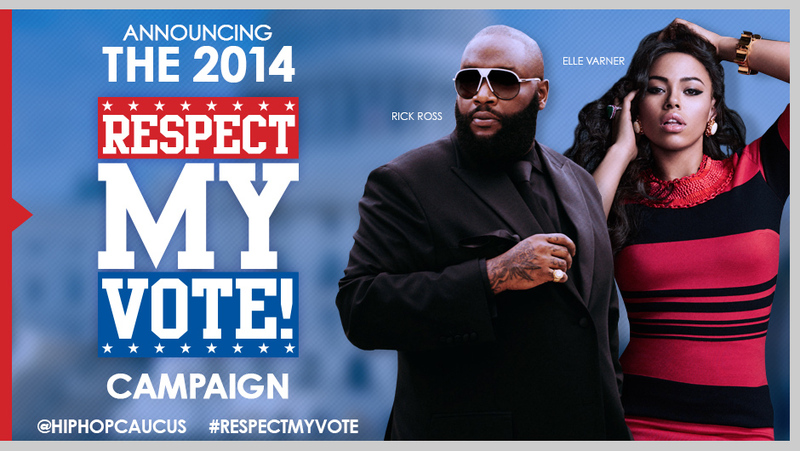 PRESS RELEASE: Rick Ross and Elle Varner Join Hip Hop Caucus “Respect My Vote!” 2014 Campaign to Mobilize Youth Vote in Mid-term Elections - RESPECT MY VOTE! June 25, 2014 (Washington, DC) – The national, non-partisan, Hip Hop Caucus announced the launch of their 2014 get out the vote campaign, “Respect My Vote!” to increase young voter turnout in the mid-term elections. Recording artists Rick Ross and Elle Varner announced their involvement today in the five-month campaign to register and mobilize 18 – 40 year-old voters, with a primary focus on those living in urban communities and on Historically Black Colleges and University (HBCU) campuses. The “Respect My Vote!” 2014 campaign will inform young voters about the elections in their states, and focus on four key issues for the Hip Hop community: Jobs, Racial Justice, Climate Change, and Education. The Hip Hop Caucus is announcing their 2014 campaign on the one-year anniversary of the Shelby v. Holder decision, in which the U.S. Supreme Court invalidated a key provision of the Voting Rights Act. The Shelby case gutted a critical piece of civil rights legislation that has helped protect this country from racial discrimination in voting since 1965. At the same time this week marks the beginning of the 50th anniversary of Freedom Summer, when young people organized in Mississippi to register as many African Americans to vote as possible over the summer of 1964. During this midterm election year all 435 seats in the U.S. House of Representatives and 35 of the 100 seats in the U.S. Senate (including 3 mid-term vacancies) will be contested; along with 38 state and territorial Governors races, 46 state legislatures (except Louisiana, Mississippi, New Jersey and Virginia), four territorial legislatures and numerous state and local races. “Respect My Vote!” will reach a national audience through earned media and an online organizing campaign (the website for the campaign is www.respectmyvote.com). Hip Hop Caucus will also run “Respect My Vote!” field operations in targeted communities in: Michigan, Pennsylvania, Florida, North Carolina, Ohio, Louisiana, Tennessee, Illinois, and California. This will be the fourth consecutive election cycle for the award-winning “Respect My Vote!” campaign. Hip Hop Caucus has organized young voters in 2008, 2010, and 2012 under the “Respect My Vote!” banner, and has partnered with numerous celebrities in previous election cycles, including lead spokespeople T.I. and 2 Chainz in 2008 and 2012 respectively. In 2004, those working with Russell Simmons’ Hip Hop Summit Action Network, Jay Z’s “Voice Your Choice” and P. Diddy’s “Vote Or Die!” campaign came together and launched the Hip Hop Caucus to continuously advance the interests of the Hip Hop generation in the political process. For media inquiries and interview opportunities, please contact: Nakia Hicks: press@hiphopcaucus.org or (202) 202.293.5902. About the Hip Hop Caucus (www.respectmyvote.com & www.hiphopcaucus.org): Formed in 2004, the Hip Hop Caucus (HHC) is a non-profit, non-partisan organization that leverages Hip Hop culture to encourage young people to participate in the democratic process. Through a collaborative leadership network, HHC addresses core issues affecting underserved communities. HHC programs and campaigns support solution-driven community organizing led by today’s young leaders.